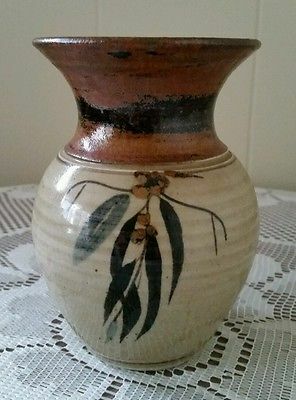 Hans Wright and Stan Burrage started a pottery in 1962 at Springvale, Victoria. Both had previously worked as salesmen. Hans had completed an art course at Melbourne Technical College, now RMIT University. 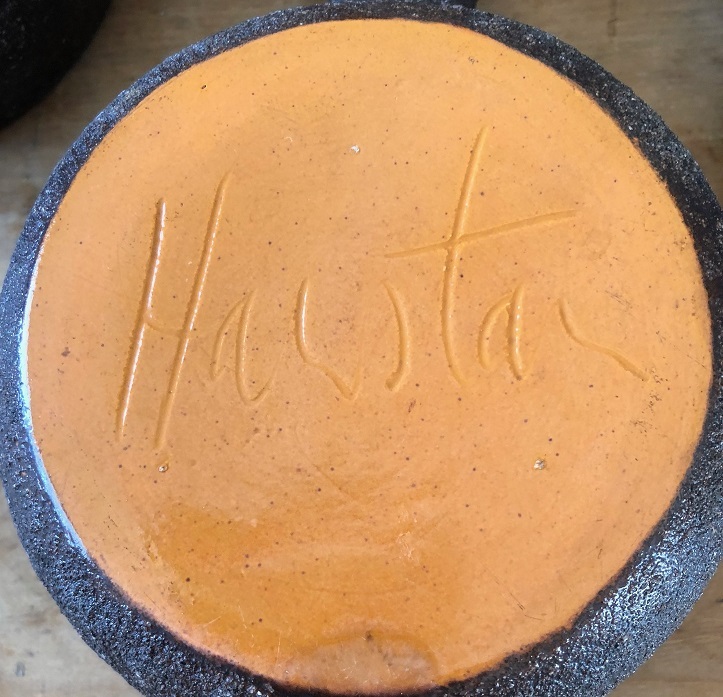 Work was marked ‘Hanstan’ or ‘Hanstan Studio’ (incised). popular in the early 60’s. 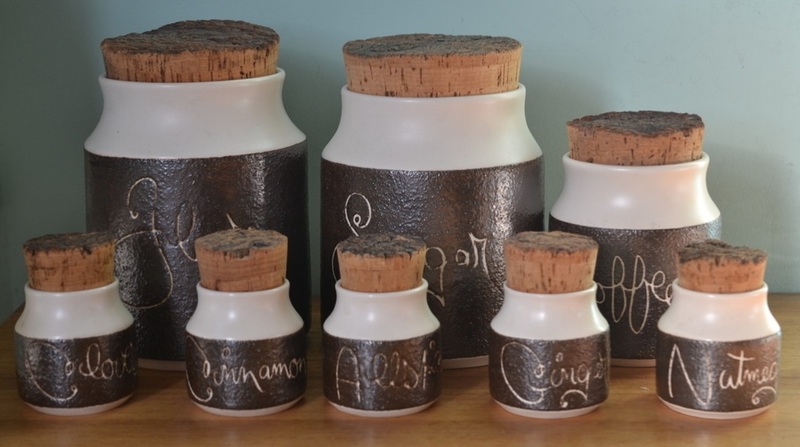 These ramekins are Raw Sienna, one of the brown pigments most widely used by artists, since the Renaissance. This natural iron pigment takes its name from Sienna, where it was mined. Along with ochre and umber, it was one of the first pigments to be used by humans, and is found in many cave paintings. 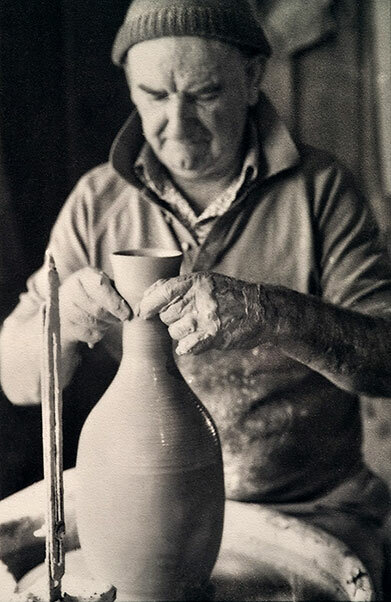 After the partnership was dissolved in 1964, Hans and his wife Patricia continued the pottery at an industrial site on the Mornington Peninsula until well into the 1980s. Hanstan was on wedding lists in the 1970s. Hans Wright became Australia’s first international medalist (bronze) in the FITA World target championships in 1969 and was still competing at the 2002 World Masters Games. Hans is a member of the Australian Archery Hall of Fame and was awarded an Order of Australia Medal in 1979 for services to the sport of Archery. He joined the National Archery in Schools Program (NASP) in 2009 as national coach, sharing his knowledge of the sport with participating school children. As national coach for NASP, he worked alongside teachers to improve their archery coaching skills and with the students in the program to help improve their technique. NASP is sweeping the globe as a program targeted at students in years 4 – 12 that promotes the importance of education and physical activity. Originally launched in the United States, the concept has been rolled out in schools around Australia. Edinburgh Pottery (1972-2005) located within the Sovereign Hill precinct in Ballarat, Victoria was set up by John Gilbert to produce wares in a 19th century style for the tourist market. In practice, it was a training ground for young potters, who produced a wide range of well-made functional items in the Anglo-Oriental style. Ironically, while Edinburgh Pottery flourished for many years in its Sovereign Hill setting, most of the domestic ware in use on the Ballarat goldfields was imported from the Staffordshire potteries of England. One of the reasons for its closure in 2005 was that, historically, such a pottery had never existed in Ballarat in the 1850s. 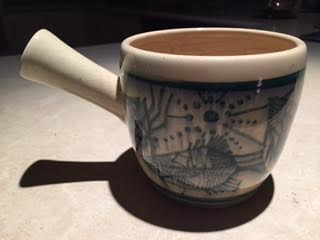 Edinburgh Pottery ware is impressed ‘Edinburgh Pottery Ballarat’. John Gilbert was born in Albury, Victoria. He worked as a teacher while completing a Certificate of Art at the Technical College in Marlborough, before moving to Ballarat in 1958. From 1960-61, he studied for a Diploma of Art at the Ballarat School of Mines and later lectured there until ill health forced his retirement in the late 1970s. At his studio at Mt Helen, near Ballarat, he produced works marked with an incised ‘Gilbert’ in a style quite different from the pervading Anglo-Oriental tradition. He had acquired a concern for form and an interest in sculpture from his teacher Neville Bunning, and from the British potter Hans Coper, whom he visited in 1968. 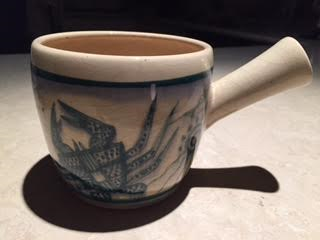 As a businessman, he was also involved in the establishment of two potteries in Ballarat the Edinburgh Pottery (1972-2005) located within the Sovereign Hill precinct, and the Old Ballarat Pottery (1973-1994) located in the Old Ballarat Village opposite Sovereign Hill. 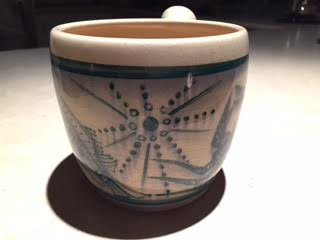 Large blue on white ramekin with crab, fish and starfish painting. Janet Gray Studio at South Yarra was established by John Knight and Isabel Grose. John Arthur Barnard Knight (1910-1993) was born in Warracknabeal, Victoria. 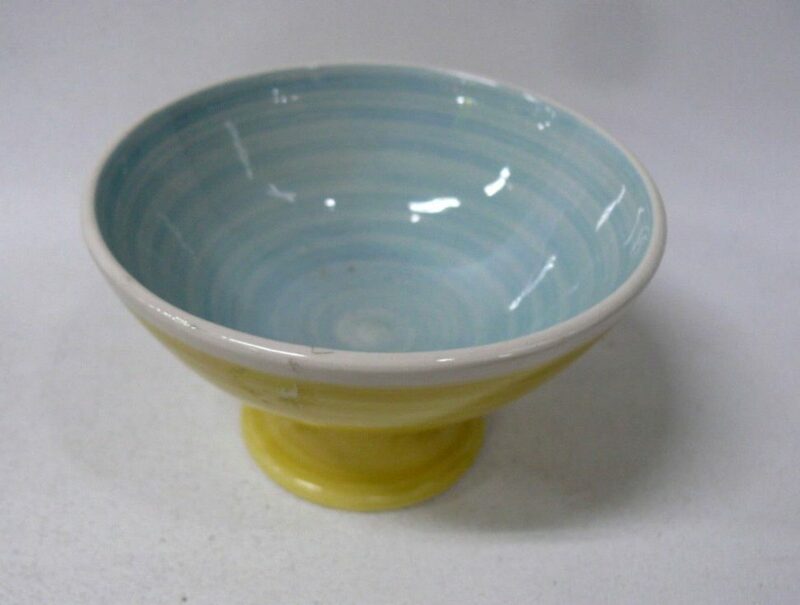 He studied art at the School of Applied Art at the Melbourne Technical School (now RMIT University), and production methods at the Hoffmann and Maribyrnong Potteries, and also worked in the studio of Napier Waller from 1932-33. 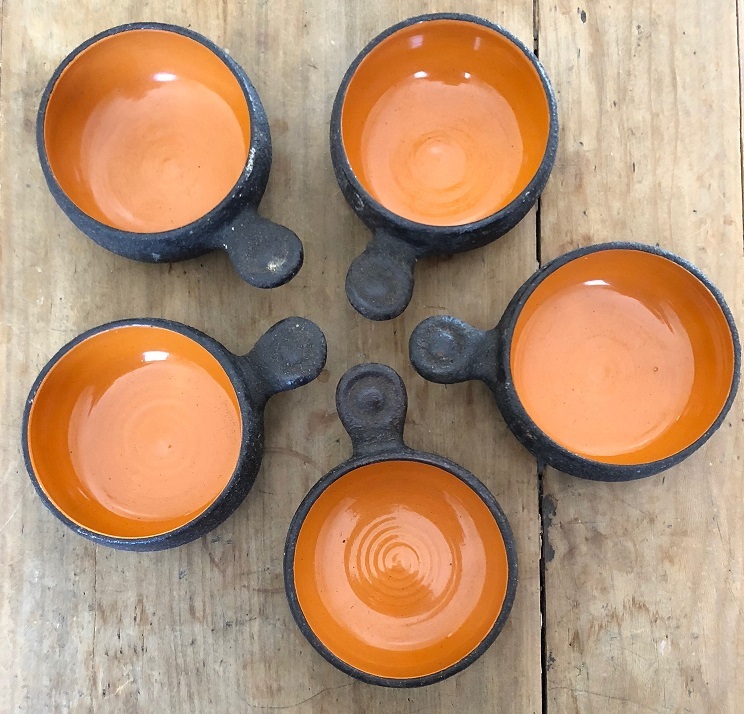 After graduating, he joined the staff, teaching pottery, modelling and drawing. In 1939, he took charge of the Pottery Department. In 1940 he married Isabel Grose, one of his students, and they established the Janet Gray Studio at South Yarra. He served in the RAF from 1942-1945, then continued to expand the Janet Gray Studio and to re-organise the teaching of pottery at the school, establishing courses for the Commonwealth Reconstruction Training Scheme, and upgrading classes to certificate and diploma courses in 1949 and 1950. He is best known as an educator, continuing to teach at RMIT until 1975. 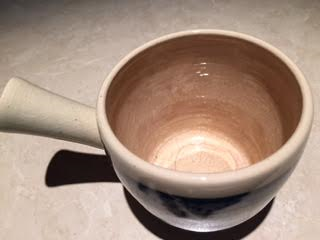 A ramekin is a small single serve heatproof serving bowl used in the preparation or serving of various food dishes, designed to be put into hot ovens and to withstand high temperatures. 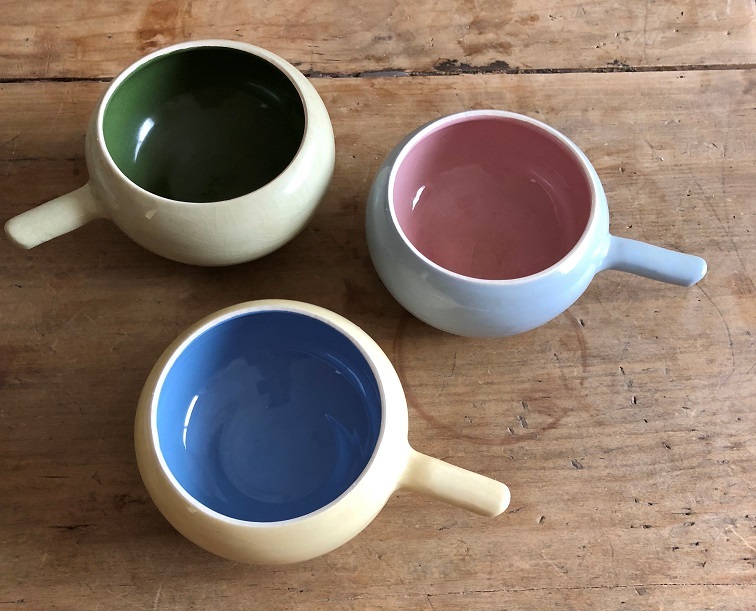 They were originally made of ceramics but have also been made of glass or porcelain, commonly in a round shape with an angled exterior ridged surface. Ramekins are now used for serving a variety of sweet and savoury foods, both entrée and desert. They are also an attractive addition to the table for serving nuts,dips and other snacks.